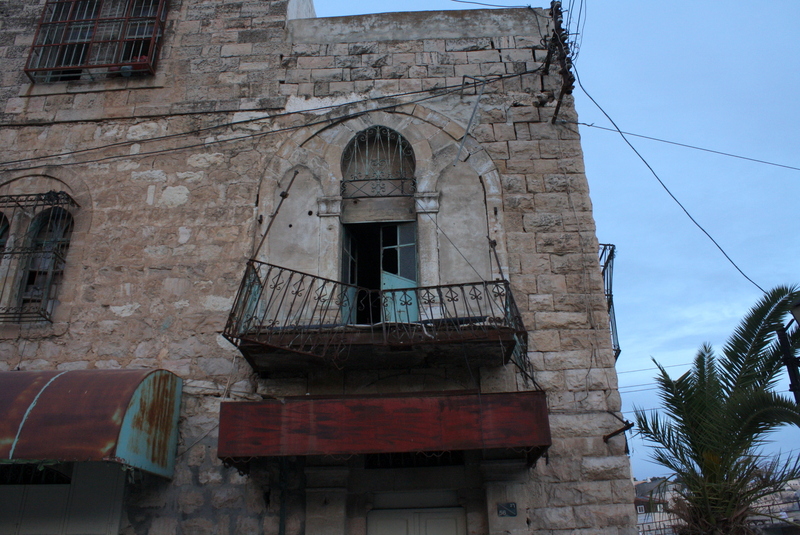 The window and balcony of this old Palestinian building have been crushed and abandoned. 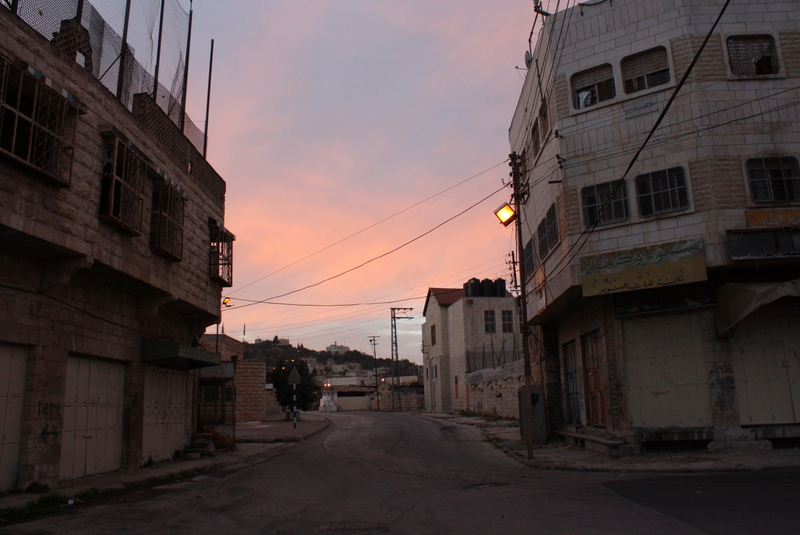 Though most families formerly living on this street have fled due to intimidation from settlers and the closing down of the street, some Palestinian families continue to live in these buildings. 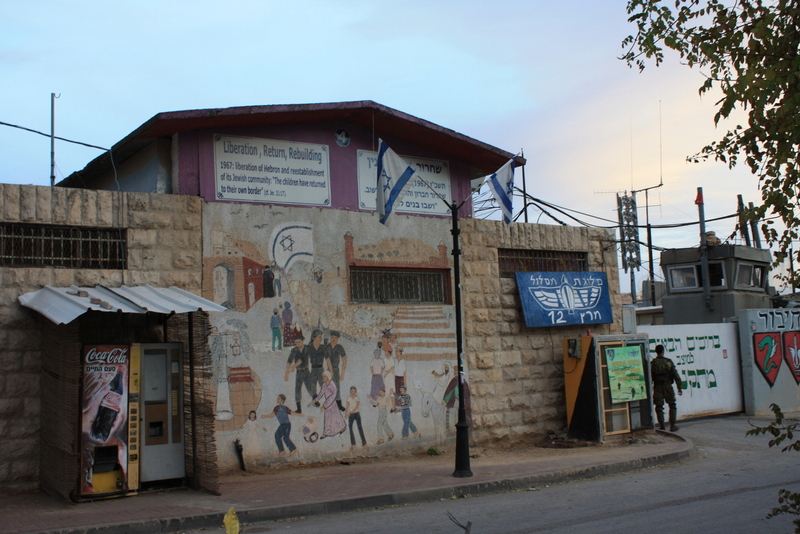 A military surveillance point stands next to a series of murals and signs laying out the settler narrative of Hebron’s history. This panel marks the year that Israel began occupying the West Bank and Gaza, 1967, and reads: “liberation of Hebron and reestablishment of the Jewish community: ‘The children have returned to their own border.’ (Jer. 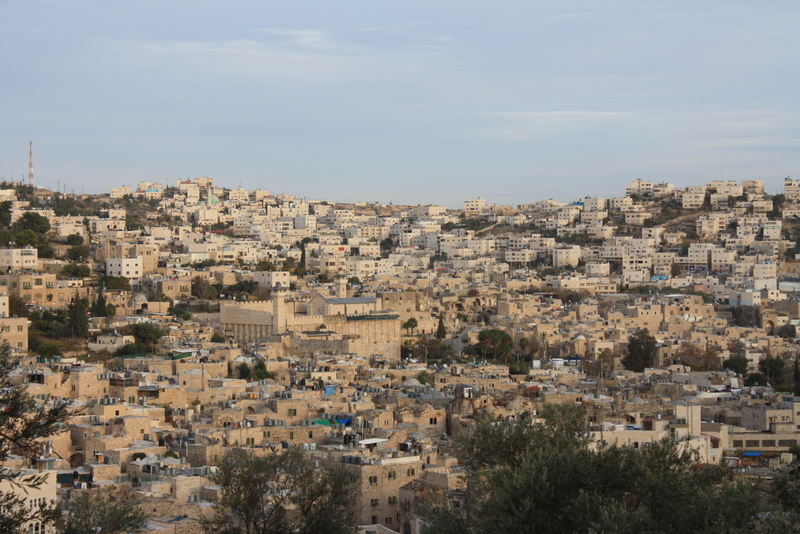 31:17)” Hebron did indeed have its own Jewish community, long before the creation of the state of Israel, but this version of history ignores the many diverse groups that have called Hebron home over the last thousands of years. The 1967 “liberation” of Hebron spoken of here in reality represents the colonization and oppression of the vast majority of the current population. A leftover Arabic sign over a now-closed market. “I was just taking a picture of the street,” I told him, which was true. “Oh, I thought you were taking a picture of me.” (If only.) He said this with a laugh, but somehow did not sound pleased. Now onto the Palestinian side, the remaining market of the old city. It also looks abandoned, but this is only because the shops have closed for the night. 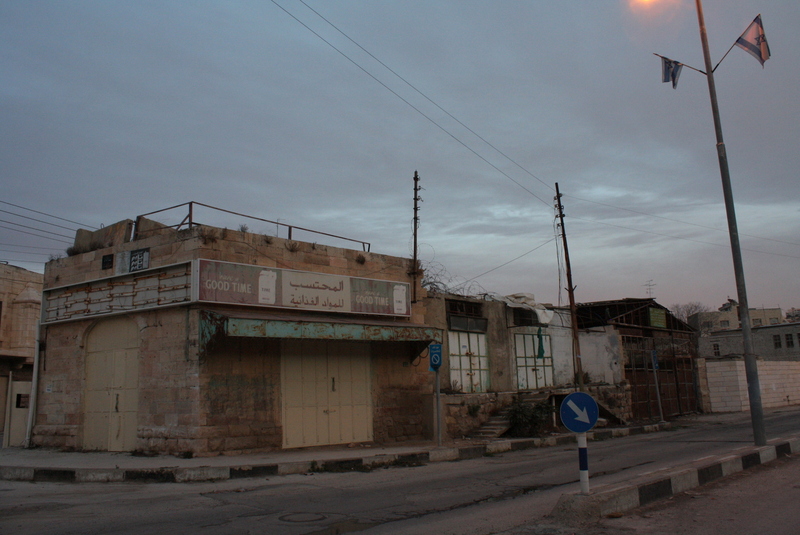 Settlers have moved into buildings above the market, even though it is the designated Palestinian side. It is therefore common to look up and see a military lookout or “security” camera pointing in your face. 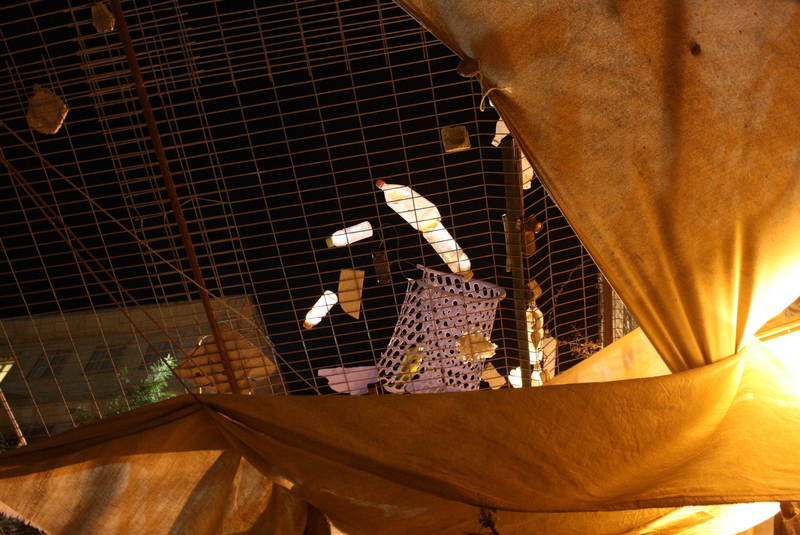 Along this old city market street, netting and other barriers have been placed above the street in order to trap garbage that is commonly thrown by settlers down onto their Palestinian neighbors. It offends one’s sensibilities to see such obvious segregation and racism. And Hebron is a particular example because this is a space where colonizer and colonized continually confront each other, be it the Palestinian children standing aside to let Israeli settlers pass by, or the more despicable “settler march” that takes place every Saturday afternoon, in which settlers from the community march through the narrow Palestinian market street, M-16s slung around their shoulders in a grand display of power and dominance over the Palestinian population. Of course, heavily-armed soldiers walk with them to protect their every move, but this irony seems lost on the marchers. Settlers here are understandably seen as far more extreme than other settlers—surely, you have to have significant cajones to live among a population that purportedly hates you, where you are entirely outnumbered and must have soldiers present to “protect” you wherever you go. And it can’t seem desirable to most to live in this now-lifeless ghost town, rendered empty because the state protecting you has made it so. Certainly this is not why most settlers move to settlements (indeed, many are looking for the exact opposite: open green spaces, cheaper rent, and more protections from the government). But the city of Hebron and Shuhada Street only reproduce on a micro-level the logic of the Israeli occupation of the West Bank as a whole. 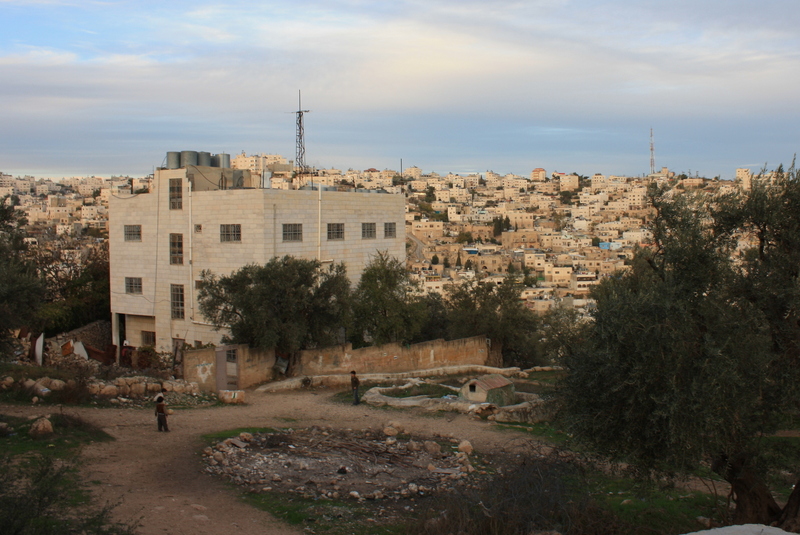 In his book Hollow Land, Eyal Weizman argues that there is a certain visual logic to the occupation—that there is a reason settlements are built on hilltops often overlooking Palestinian communities, and that there barely exists a Palestinian area in the West Bank from which a settlement is not visible. Cameras look down from the settlement walls in the same way that security cameras and military lookouts are placed periodically along the old market on the Palestinian side of Hebron. An intricate system of checkpoints and closures dictates where and when Palestinians can and cannot go (or build, or plant). 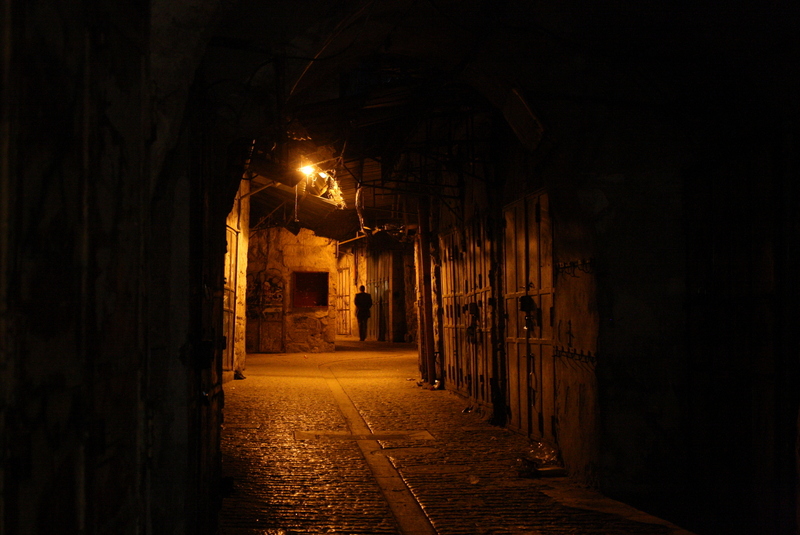 While near a typical settlement it may be a Jews-only highway built on Palestinian land, in Hebron it is Shuhada street, which was once the urban and commercial center of the city. Even if it is on a more compact scale, it is the same apparatus at work. 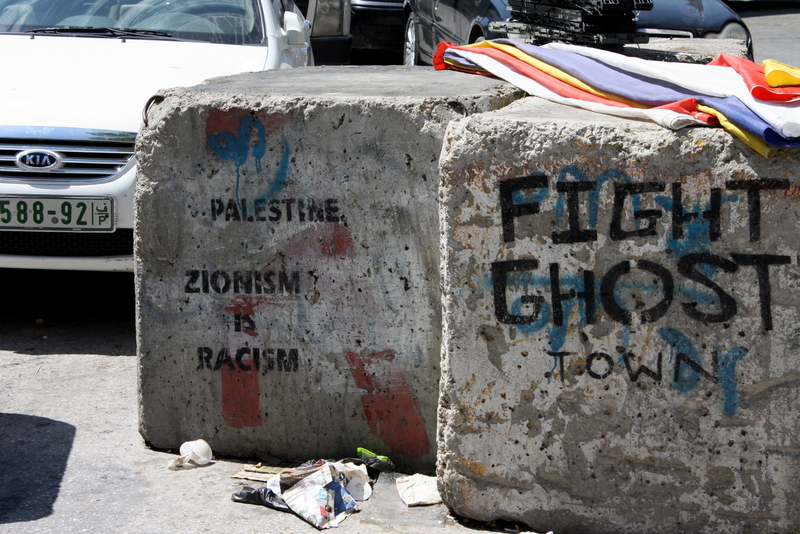 It is the same system that divides Palestinians not necessarily from Israelis but from other Palestinians, and that pushes them further into cramped urban enclaves from the inside out—with settlements co-opting more and more West Bank land, and settlements in Hebron and Jerusalem expanding from inside city centers. The same system that demands permits from Palestinians to traverse their own land, the same one that stifles the Palestinian economy and any chance at a sustainable livelihood. Hebron is not an exception to the rule. Hebron is a mere magnification of Israeli policies that take place on a grander, more diffuse scale throughout historic Palestine. Weizman, Eyal. 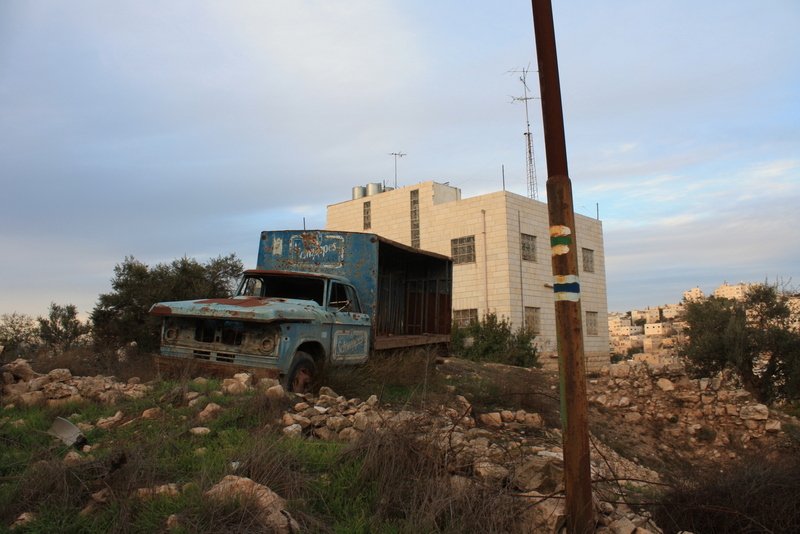 Hollow Land: Israel’s Architecture of Occupation. London: Verso Books, 2012. 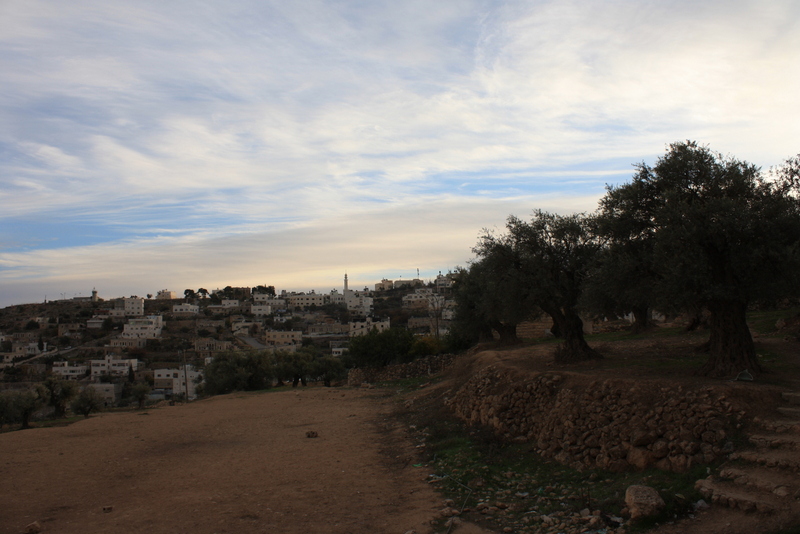 B’Tselem. 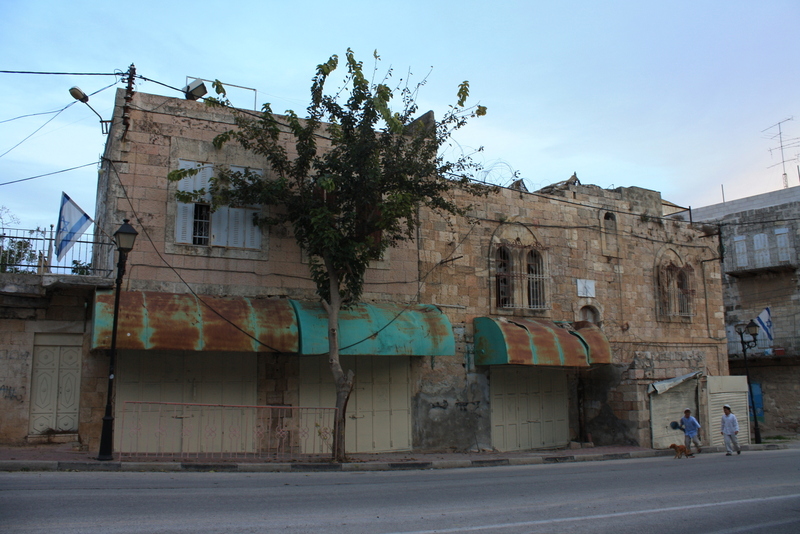 “17 years after Goldstein Massacre, Hebron city center paralyzed.” March 3, 2011. Accessed September 6, 2013. http://www.btselem.org/hebron/20110303_hebron_17_years_after_goldstein_massacre.